Visit the area which has been the setting for James Bond's film “For your eyes only”. 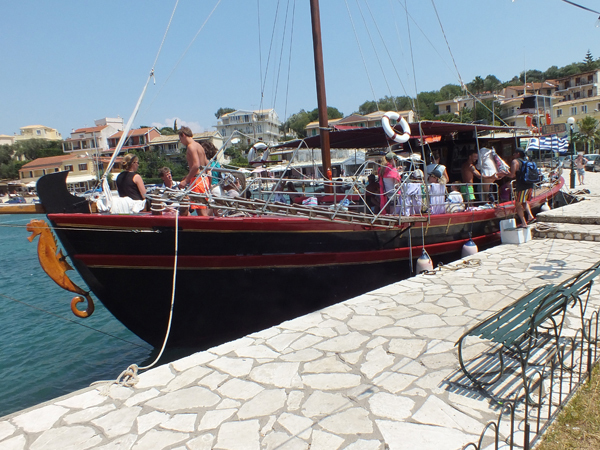 The cruise starts from Kassiopi and heads down the East Coast stopping in Kouloura – Kalami and Nissaki. A relaxing cruise on the most scenic coast of Corfu . On the way back you visit the Blue Caves of Barbati and make a stop for refreshments at Ag.Stefanos. A marvelous day of Sun & Sea, a mouth watering BBQ lunch, chicken, Burgers, salad, fruit and plenty of wine, all included in the price. Relax on the beach facing Albania , top up your suntan while Captain and his mates prepare your BBQ.Not to be missed!! 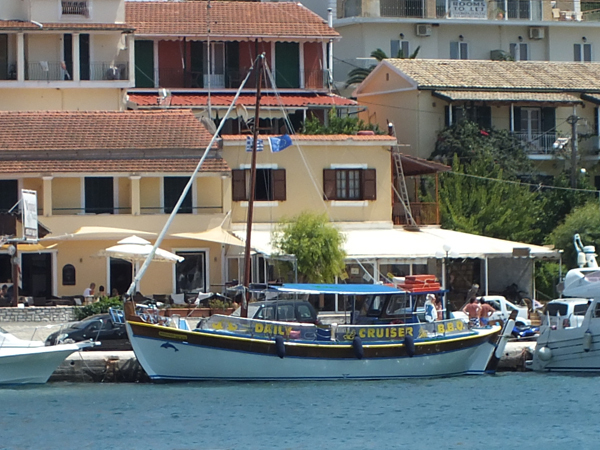 A combination of a day cruise and Corfu Town . A sail a sail along the eastern coast gives you a chance to admire the views of Kouloura-Kalami-Ipsos-Dasia. Three hours in Corfu Town for sightseeing and bargain hunting is a welcome break. This is your chance to feel like taking part in one of those reality shows where they drop you of on a desert island with a bunch of strangers and no food. The difference is that you will have loads of food at the nearby taverna and that the island will be one of the most beautiful and peaceful spots you ever visited. Sunbathe and sightsee at the same time !! Our luxury cruiser sails along the coast of the eastern part of the island towards Vidos Island, once Corfu’s Alcatraz, which has been of significant strategic military importance for centuries. Now it is the ideal place for those who want to see the “wild” part of the nature of Corfu. It is the perfect place for nature lovers and you will have lots of time to explore. When we continue towards Mouse Island, have your cameras ready as we pass attractive spots such as Corfu’s Old Fortress and the Mon Repos Palace, birthplace of Philip, Duke of Edinburgh. After we go as close as possible to Mouse Island & Vlacherena - Corfu’s most famous landmark- we serve a cold buffet onboard with free wine, all included in the price. On the return trip we call at a pretty bay with further opportunities for swimming. For those who need stress therapy and are wanting a quiet chilled out day, this is the ultimate relaxation trip. We will take you to places only accessible by boat. You will visit such places as Turtle Bay, Adonis Beach and Neptune’s Pass depending on the day. Lots of chances for swimming, snorkelling or join in the on board quiz and unwind on a golden beach. Picnic lunch Included. This is the BEST way to visit Corfu Town! It is a leisurely trip between the North East Coast of Corfu and the coast of Albania. On deck you can have a cold drink from the sailors’ bar, and enjoy the trip in comfort which will take approximately an hour. When we reach the old port in the heart of the historical centre of Corfu town you will have almost four hours to use at your leisure. The Palace, the new and the old fortresses, the famous St. Spyridon Church, are just a few of the monuments and tourist attractions that we have in Corfu. Alternatively, the narrow streets of Corfu town are filled with an abundance of fine wares, beautiful Corfiot lace,jewellery, pottery and much more.Don’t forget to visit the Famous Liston Square and enjoy a drink or try traditional Corfiot or international cuisine in one of the many restaurants. A relaxing and unhurried cruise along Corfu’s most beautiful coastline.There’s regular stops for sight-seeing. Swimming and photos.A good way to improve that tan. The boat pulls in to a jetty at each scheduled stop. A chance to see some of the prettiest villages, coves and bays:-Kouloura – with it’s pretty horseshoe harbor, kalami – with the famous Durell white house, Nissaki great for watersports, St.Stefanos – where the rich & famous take their holidays. We also call at the fabulous blue caves where you may swim from the boat. For the more adventurous there’s also a chance to dive for champagne.If you’re lucky you may see the dolphins that can often be seen playing in this area. This trip suits everyone. Sun worshipers get even browner – kids simply love it – sightseers get to visit the most beautiful place . And you all get to sample the captains famous punch drink – free.